Users of DMARC Analyzer often reach out to us in order to generate a DMARC record. To implement DMARC you must generate a DMARC record with many variables such as the DMARC policy. Generating a DMARC record isn’t complex, though it’s very important to use the correct syntax as provided in the DMARC standard. Our software solution DMARC Analyzer helps you to get the DMARC record generation job done easily with our DMARC Record Generator. 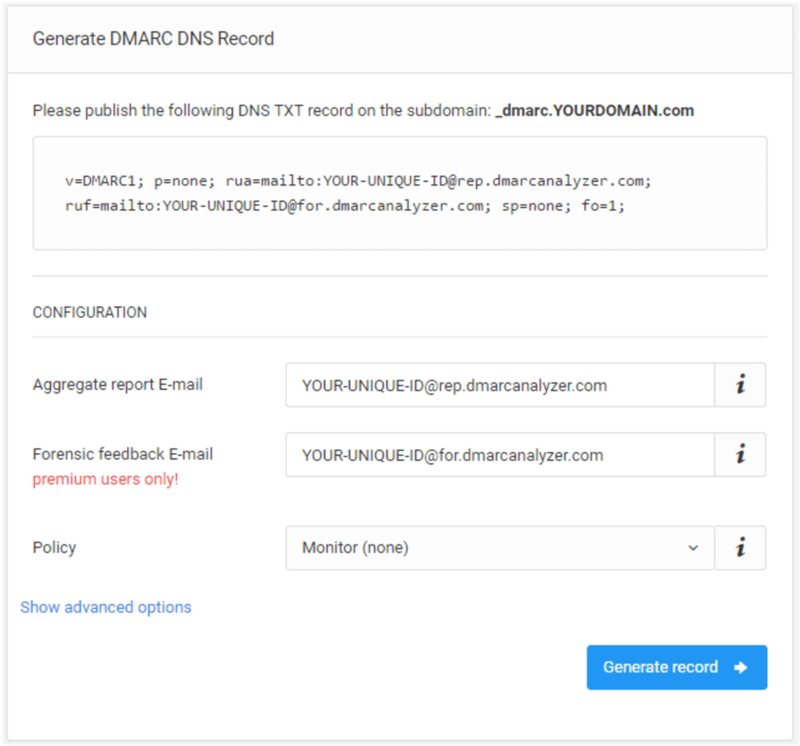 The free version of DMARC Analyzer allows you to use the DMARC Record Generator (signup here). Furthermore, you can use the free DMARC Record Check to validate your DMARC record; even without signing up. DMARC Analyzer generates a unique email address which matches your account. Please use this email address in your DMARC DNS record. DMARC Analyzer needs to collect data before it can generate any statistics. To collect data in DMARC Analyzer you need to add a DNS record. This tool will help you do that. Fill in the information below and press ‘generate record’. This tool will generate a DNS record which you can publish to your DNS settings (your domain ISP can do this for you as well). Once this record is published, a daily report will be sent to the specified email address to collect data. You can also have forensic emails (specific erroneous emails) forwarded to this address. If you have multiple domains which you’d like to analyze, just add this DNS record to multiple domains. All domains will appear in your dashboard. How to use the DMARC Record Generator? You’ll need to sign-up for a free DMARC Analyzer account in order to use our DMARC Record Generator. You can use the DMARC Record Generator by creating a free DMARC Analyzer account. Use the record setup guides for guidance on how to set up your DMARC record for specific webhosts.